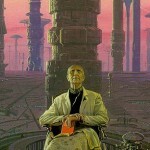 Roland Emmerich To Turn Isaac Asimov’s ‘Foundation’ Into ‘Avatar’? The names Roland Emmerich and Isaac Asimov are about as opposite as two elements of the same basic spectrum can be. Emmerich is known for his massive end of the world disaster films like Independence Day and 2012, but has also faced much criticism for his lack of other crucial story elements, specifically with titles like Godzilla, 10,000 B.C., and The Day After Tomorrow. Asimov is a legendary author and a master of the realms of science fiction literature. He has written over 500 books and was also a professor of biochemistry at Boston University, just to note a couple of his awe-inspiring lifetime accomplishments. His most popular work as an author are his seven-book creation known as the Foundation series. So what do these two have in common? Well, Roland Emmerich is currently the man who holds the arduous task of trying to adapt Asimov’s Foundation into blockbuster movies, of course! And with the knowledge that Emmerich is the man handling this, one of the most classic of series in science fiction literature, fans of Asimov may not want to read further. In a chat with MTV, Emmerich has revealed his plans for what is to become a trilogy of films, and yes, it does involve lots of CGI and that oh-so-popular 3D treatment. The director was also open and content with his goals to use James Cameron’s Avatar as the blueprint for his Foundation movies. The Avatar technology applies to Foundation. It has to be done all CG because I would not know how to shoot this thing in real. This won’t be the first time that something at least Asimov-inspired has touched the Silver Screen: director Alex Proyas has two movies — i, Robot and Knowing — that are born from the brain of Asimov. Knowing is actually something of its own take on the Foundation series, as it were. So, my friends — is all of this crazy new technology the only way that something, like Asimov’s Foundation can be brought to film, or is this going to be a too far, too much situation? ‘Firefly’ Joins The Fight Against The Evil ‘Twilight Saga’!